The date was January 3, 2008. Facebook had kicked me off for running a script to try to save the common web. 1. It grabbed all my friends names. 2. It grabbed all their phone numbers. 3. It grabbed all their email addresses. 4. It gave me a simple CSV file with all that data so I could bring them back to Google, or Microsoft, or anywhere else I wanted to put them. Facebook’s answer was predictable. They shut me down. Oh, a few people supported me. Joseph Smarr, for one. Marc Canter, for two. It isn’t lost on me that Joseph now works on the Google+ team and Marc isn’t in the San Francisco area anymore. They understood what was at stake: the future of the web. But many others said I deserved to be kicked off of Facebook. Did I get invited to speak at John Battelle’s conferences about how the common web was screwed? No. Did Dave Winer lead a SOPA-like protest? No. Mike Arrington and I had violent disagreements on the Gillmor Gang about my motives. Heck, these arguments continue to this day. Yesterday Steve Gillmor, again, on yesterday’s Gillmor Gang, said I had broken Facebook’s Terms of Service, which implied that I deserved to get kicked off. I had, but I was trying to save the common web. The message was loud and clear: Facebook should be allowed to be a data roach motel: data can come in, but damn you Scoble if you want to take that data back out. The lesson today, four years later, is that the common web is in grave threat, not just from Facebook’s data roach motel but from Apple’s and Amazon’s and, now, Google. It isn’t lost on me that Joseph Smarr now works at Google and that some of the others who spoke up on my behalf now work at Facebook. Now do you get why I really don’t care anymore? The time for a major fight was four years ago. I understood then what was at stake. Today? It’s too late. My wife is a great example of why: she’s addicted to Facebook and Zynga and her iPhone apps. Me? I really don’t care anymore. I’m locked into Vic Gundotra’s trunk where Google+ has helped me get 400,000 followers since July 1st last year alone. That’s, what, seven months? Did RSS ever do that for me? Did Dave Winer’s systems ever do that for me? Did John Battelle ever put me on stage to help me out? No way. I’m not going back to the open web. Why? The juice isn’t there. So, what would I do now? What’s Dave Winer’s answer? He deleted his Facebook account and is working hard to try to get people to adopt RSS again. Sorry, Dave, but Twitter is a better place to get tech news. Not to mention that the best place to read that list is Flipboard on iOS. Sorry, will RSS help me get new access to Google’s search engine? No. Will RSS help me get access to Facebook’s Open Graph, which let Spotify share five billion songs in the first few months of its existence? No. Will RSS help me get access to your Facebook news feed? No. Will RSS help me get a better Klout score? No. Will RSS help me get a speaking slot at O’Reilly’s conferences? No. Will RSS help me talk with my wife, and her friends, who are all addicted to Facebook? No. Will RSS let me get my photos onto Instagram? No. Will RSS help me get my food consumption behaviors onto Foodspotting? No. So, cry me a river. I’m a user. I tried to stick up for the common web in 2008. Where was the protest then? I was called an “edge case” and someone who should be ignored. Sorry, Dave and John. It’s too late to put the genie back into the bottle. And next time someone tries to point out that the “data black holes” of these big companies are something that should be fought against maybe you’ll be there with a better protest than what you put up. It’s too late. Now, excuse me, while I crawl back into the trunk that Google, Facebook, Amazon have locked me in. It’s interesting to go back and read those comments. Chris Saad is one that has been very consistent for four years. He built a company, Echo, which is still trying to keep our content separate from these big “data black holes.” If anyone deserves credit for trying to keep the web commons alive, it’s him. What’s the right way to protest TODAY? 1. Don’t delete your Facebook account. Deleting your account just makes you look like a weirdo in today’s world. Dave Winer has that luxury, but most of us don’t. 2. Make ALL data on your Facebook account PUBLIC. Most technologists have done the opposite. To the point where if you aren’t friends with most geeks you can’t even see ANYTHING on their account. That isn’t helping the commons. 3. Work to figure out how to get our data OUT of Facebook, Google+, and Amazon and back into the commons. Me? I’m just a user and I grew tired of this fight back in 2008. That was the year we could have done something about it. Today? No, sorry, most of this argument doesn’t make any sense to real users. My wife doesn’t care and, even, doesn’t like being in the open web for a whole lot of reasons. Today? No, don’t put me on stage at conferences. Get regular people, like my wife, who could tell you why they don’t like the open web and, why, even, they are scared of it. But, no, it makes for beter headlines to try to fight. John, where were you? At least Dave has been consistently trying to keep us putting content on blogs and on RSS, which ARE the open common web. It’s just that it’s too late. We’re firmly locked back in the trunk and the day for blowing open the trunk has come and gone. Now, excuse me while I check into Foursquare, message my friends about the parties at SXSW on Facebook, find a cool meal to have tonight with my wife on Foodspotting, and go back to posting on Google+. 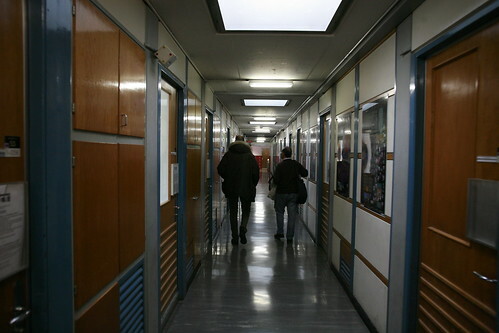 PHOTO CREDIT: I shot this photo of the hallways of CERN, which is where the web was invented. UPDATE: already there are more comments on Google+ than are here. On Facebook there’s quite a bit of reaction too. Sort of underscores my point, no?